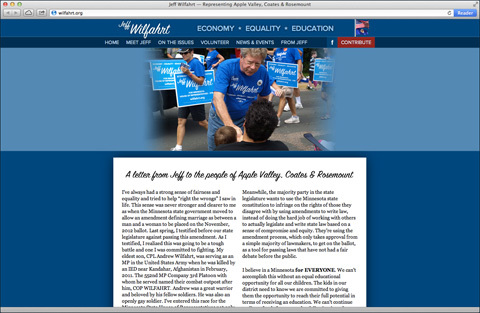 When I first heard that Jeff Wilfahrt was running for the Minnesota State House of Representatives, I knew I had to get involved in his campaign. I had seen Jeff give a moving speech at OutFront Lobby Day, remembering his son, a soldier who was killed in Afghanistan and who just so happened to be gay. Jeff gave a tearful speech against the anti-gay marriage amendment, about how his son fought and died for a country and state he loved, and how the best way we could honor his memory is to reject a message that his love wasn’t good enough. Jeff and his wife, Lori, are amazing people, and I’m honored to be working with them. Check out Jeff’s site (archived), and please chip in a few bucks or volunteer some time for his campaign.